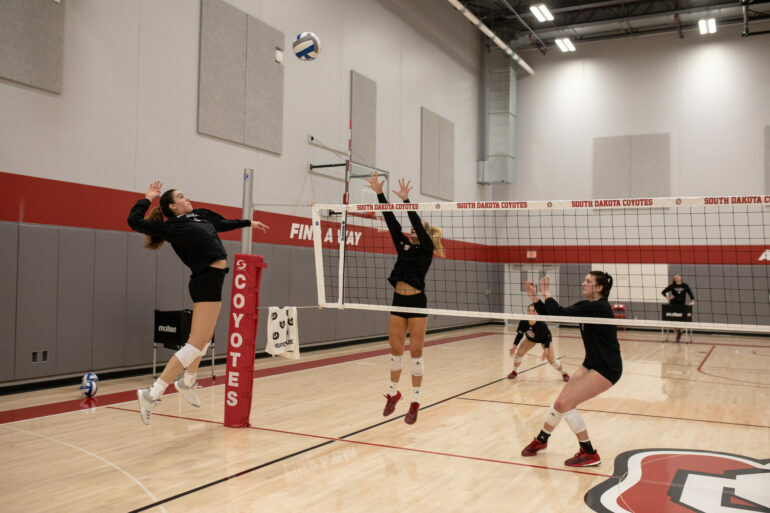 Exactly two months ago, the most successful season in USD volleyball history concluded in the first round of the NCAA tournament, twelve days after the Coyotes upset top-seeded Denver to earn their first appearance to the big dance. To add to 2018’s good fortune, the team received more news before the turn of the year: Sophomore Sami Slaughter, 2016 S.D. Gatorade Player of the Year, and freshman Maddie Wiedenfeld, a member of the America East All-Rookie team, would join the reigning Summit League champions at the start of the spring semester. Slaughter, a 6-foot-1 outside hitter from Harrisburg, S.D., spent two seasons at Nebraska before her transfer. In 2017, Slaughter played six matches for a Cornhusker team that notched their fifth national title. Last season, she totaled 25 kills and 11 digs in 18 matches. Nebraska fell to No. 1 Stanford in the title match. In one season at New Hampshire, Wiedenfeld, a 6-foot-2 middle blocker from Omaha, played all 27 matches, tallying 252 kills and a .277 hitting percentage, earning America East Rookie of the Week honors thrice in September. Now on campus, Slaughter and Wiedenfeld are adjusting to life in Vermillion. ‘Home’ is what drew Wiedenfeld back to the Midwest. Recruited to go east after four years at Marian High School, she said the town of Durham, N.H. was too far from home. Inversely, Slaughter arrived from a campus of over 25,000 students, nearly 2.5 times more than USD’s student enrollment. In fact, proximity played a large role in the players’ choice to compete at USD. Though they were raised in different states, Slaughter and Wiedenfeld’s families grew up in Hartington, Neb., a town of 1,500 people just 33 miles southwest of Vermillion. Head coach Leanne Williamson said her and her staff initially recruited Slaughter during her time at Harrisburg High School, where she led the Tigers to a Class AA state title, compiling a school record 39 kills in the championship match. Michael Runde, associate head coach, first saw Wiedenfeld during her club career in Omaha, and this season, Williamson was lucky enough to get a look at Wiedenfeld before she made the decision to transfer. The two teams met in late August at the Panther Invitational in Milwaukee, where USD downed UNH 3-1. Williamson said right now, the objective for Slaughter and Wiedenfeld is to acclimate themselves with the program. Slaughter said the two are like “incoming freshman” all over again, but according to Williamson, so is everyone else during the spring months.